Why Technical Dive in Lanzarote? Here in Lanzarote the diving is 12 months of the year. The waters are warm, ranging from 18 degrees C to 25 degrees C, safe and clean with good visibility, upto 50m+. Ideal temperatures in the mild winters for those dry suits. The air temperatures are also fabulous, hot in the summer with a cooling breeze, just as you would expect for being off the west coats of Africa on a similar latitude to the Red Sea. In the winter it is cooler but still t-shirts and shorts weather but you may need a hoodie in the evenings. The roads are in good condition and the island is clean and well looked after. The dives sites have easily accessible entry and exit points which make getting all that tec gear in and more importantly out again afterwards safe and easy. Depths of 100m+ can easily be achieved. By having the diving, buoyancy and finning skills associated with being a tech diver you will not distrub the wildlife as easily and therefore you will be able to observe the marine wildlife for longer. There are good flight connections to Lanzarote from the UK, Ireland and the rest of Europe too. 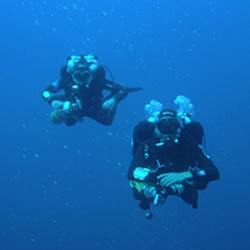 What Technical Diving is available in Lanzarote? At Lanzarote Dive Centre we offer fixed priced Technical diving packages, so no scarry gas bills at the end of you diving. Lanzarote Dive Centre is Technical Diving Centre offering the Technical Diver everything what they need for Technical Diving, our dive centre is localted in Puerto del Carmen, Lanzarote. At Lanzarote Dive Centre we have our own full-time Technical Instructor on staff able to teach either TDi or PADi technical courses.